A Philadelphia family says a beeping noise during a movie disrupted their family night out at a theater, and when they asked for a refund, they say they got one -- but they were not allowed to go get their children and police were called. The story is raising concerns about racial injustice. 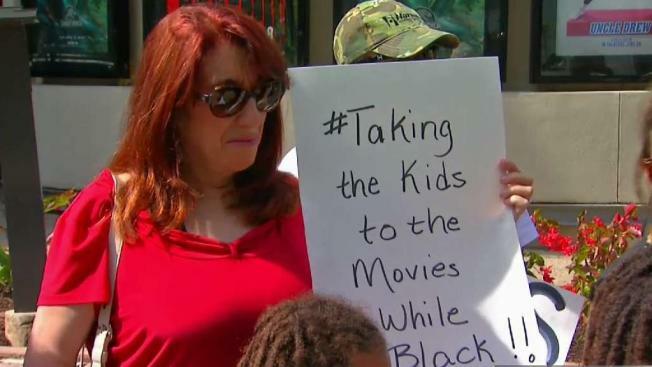 A black family says a Philadelphia movie theater manager called police when they tried to retrieve their children from the theater after getting a refund. Ismael and Ashley Jimenez told Philly.com they'd taken their youngest son with them to complain about a beeping noise during a Friday showing of "Jurassic World: Fallen Kingdom," leaving their three children and two of their friends in the theater. "They refunded our money, they thought we would go away. They put out a statement, blatantly called us liars, and thought we would go away. We won't go away," Ashley Jimenez said at the presser Friday morning. Ashley Jimenez tried to retrieve the children but was denied entry. Jimenez says she went anyway and police were called. In a video posted to Facebook, several officers are seen responding. No one was arrested. "I would never think this would happen. I'm a teacher, she's a social worker. We planned this event for over a week to have our boys and two of their friends come with us and then this happens." Ismael told NBC10. Cinemark Theatres says in a statement Tuesday "at no time was the family restricted access to their children." It says a police officer working security at the theater requested additional police but an officer "calmed the situation" and the family left. It says it regrets the family didn't have a good experience.